It’s just couple of weeks Xiaomi released the latest MIUI 8.2 update to its various Mi & Redmi series smartphones. Some of the Xiaomi phones which have successfully received the MIUI 8.2 update are Mi3/Mi4, Redmi Note 4G, Redmi 1S, Mi Note, Mi Max, Redmi 2 Prime, Redmi 3/Prime, Mi Note 2, and Mi Mix. If you own any of the following device and still doesn’t received the update, then do check the link to manually download MIUI 8.2 Global Stable update (Fastboot/Recovery ROM). Other Xiaomi users need to wait till the company releases the update. Coming to the features, the update brings an improved layout for the quick settings in the Notification shade along with addition of new system sounds and ringtones. Also MIUI 8.2 Update Features. 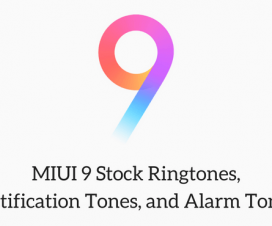 If you are yet to get the MIUI 8.2 update, you may try this wonderful Stock Ringtone collection on your phone. There are a total of 6 ringtones which have been compressed under a single .zip file. Few of them are CharmingBird, Freedom, MI, Marshmallow, MorningBreeze, and MorningStreamlet. Simply refer the above link and you’ll download all the 6 ringtones at a time. These ringtones can be used for both calling as well as for alarm purposes. For more MIUI ringtones, do check our RINGTONES section.